No matter what business you are in, if you’re paying attention to current marketing trends, you know you need to create content—interesting, relevant, consistent content for your Internet marketing to be effective. But knowing and doing are two very different things. Does staring at a blank page or canvas make you nervous? Now what if someone carved up the blank page and said “Put something about “A” here, put something “blue” in that corner over there and something that relates to “C” at the bottom. Feel a little better? A little direction takes away much of the ambiguity that makes starting so stressful and inhibiting. Next a few dates are set for launching the blog or setting up the e-newsletter. Then what happens? The blog is ready for content but your organization isn’t ready to create that content. The email template is ready but the date for sending it out keeps getting pushed because no one has time to figure out what to put in the first email, or the second or third for that matter. Why does this happen? Because there is no road map, no upfront direction that says “on this date we will release content about A, on this date, content about B, etc” It’s the blank slate staring everyone in the face, making us act like we’re all deers caught in the headlights. Here are a few steps to help you get over that blank page “hump” and generate content on a consistent basis. Generating content once in awhile is not enough. You have to do it consistently to achieve any real marketing value from it. 1. Who can realistically be in charge of content creation for our organization? Who has the time available, the tenacity to follow a content calendar and the ability to manage themself and others to get it done. 2. Do we have in house people who can write reasonably well on a regular basis or should we consider hiring an outside resource or two to help. You don’t need Pulitzer Prize winning writers; with the death of newspapers, there are plenty of great writers out there that can churn out short articles quickly for very reasonable rates. 3. Do we have the minimal equipment and talent to do video? If not, are we willing to hire someone to help? Again, videos don’t need to be something Steven Spielberg would be proud of, but there is a basic level of lighting and audio that makes a video watchable on YouTube. It’s that basic level you need to be sure you can handle or get help with. 4. Are we, as an organization, committed to creating content on a regular basis? Do we all know why we need to do this? What is the goal for creating the content? Website traffic? Higher search rankings? Increase your subscriber base? Whatever the goal is, make sure it’s front and center and everyone understands and is committed to it. Most of our clients start with a blog or newsletter. It’s best to start with one type of media, get it rolling and then branch out into something else. You can always re-purpose a piece of content posted in a blog for the newsletter or vice-versa. So off the top of your head…how many blog posts per week can your organization really commit to (based on answers in step 1) or how often can you send out a newsletter (again based on answers in step 1.) Don’t only think in terms of actual work hours, but consider peoples’ “brain space”—what they can realistically focus on. Now how much time is really needed to accomplish “x” number of blog posts or a monthly newsletter? Remember to include time for more brainstorming and for letting others know about your content. In fact, you should schedule time for brainstorming and researching on a regular basis. Then outline a monthly and weekly plan, like the one below, to accomplish that quantity. This is an actual plan we gave to a client just beginning with content creation so it is very conservative in the amount of content created and shared. “Editorial calendar” is a term borrowed from the magazine/newspaper industry. The publications would use an editorial calendar to plan well in advance what their big stories or features would be. At a minimum, in the editorial calendar you match up specific pieces of content with a release date. How detailed your own calendar is or is not will depend on your needs. You could do one for your blog and a separate one for a monthly newsletter. 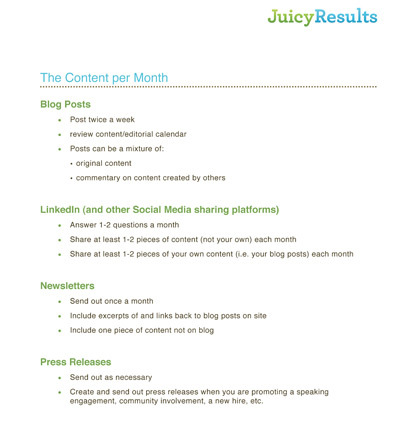 This is our own Juicy Results editorial calendar that we use to plan out our monthly e-newsletter. Download it and alter the format to your liking. (You can use Excel, Google Docs, Numbers, any application that will open a .csv spreadsheet.) It’s not fancy, just functional. Of course you will probably have different content sections that you want to use. This is a format we use for own blog. All data in the cells are fake, but you’ll get the idea. Note that we include all days of the week but we don’t plan copy for each day. When assessing our abilities (see step 1), we knew that would never happen. But we still leave the slots there so we can easily move items around, add something on the fly or simply be aware of special dates. Establish a schedule for your content output. Having the structure will make creating the content easier to accomplish and/or delegate.